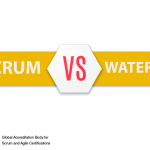 Is there any definite winner between Agile and Waterfall? 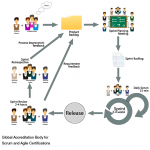 Agile and Waterfall are two different methods used in managing a project. Both the methods have their own pros and cons and choosing one mong is based on many project-centric factors. The Waterfall model is a progressive design process which in the software development industry goes through stages such as Conception, Initiation, Analysis, Design, Construction, Testing, Implementation, and Maintenance and steadily moves downwards similar to a waterfall flowing down. After one stage is completed it moves to another and every stage has its own goals. This model is based on the standard workflow process which is followed in manufacturing and construction industries. The benefit of using this model is that a project is divided into separate compartments which in turn decrease the dependency on individuals of a team. Any team member who leaves the project during the transition stages would not affect the execution of the project. This method also requires concrete documentation. The cons of this method is that it is inflexible. In this method it is not possible to go back to a previous stage to alter the design in anyway. Hence it is very important to collect the requirements at the initial stage. This method is based on the logic that once we spend considerable amount of time in gathering the comprehensive requirements at the start of the project helps in saving time and effort later on. On the other hand Agile method is incremental approach. The team works on small modules and then responds to user’s altered requirements rather than following a pre dertmined plan. The design is simple and changes can be made as work progresses. When compared to Waterfall method, here the testing and responding to user change requirements can happen during the same time in the course of the project. Here interactions among stakeholders is prioritized as compared to tools and processes. This method became popular in 1990s after the many found the drawbacks of traditional Waterfall methods. Agile is considered to be a lightweight approach. The team focuses on smaller areas of work and hence overhead becomes less. The cost of the project also becomes less. Agile is more suitable when the user requirements are not clear and where the business environment is not stable. Also successful implementation of Agile requires skilled developers and also stakeholders who know what they exactly want. 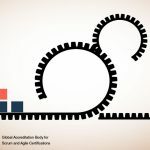 Agile and Waterfall methods- Can it be integrated?